Stay in the heart of Hollywood! 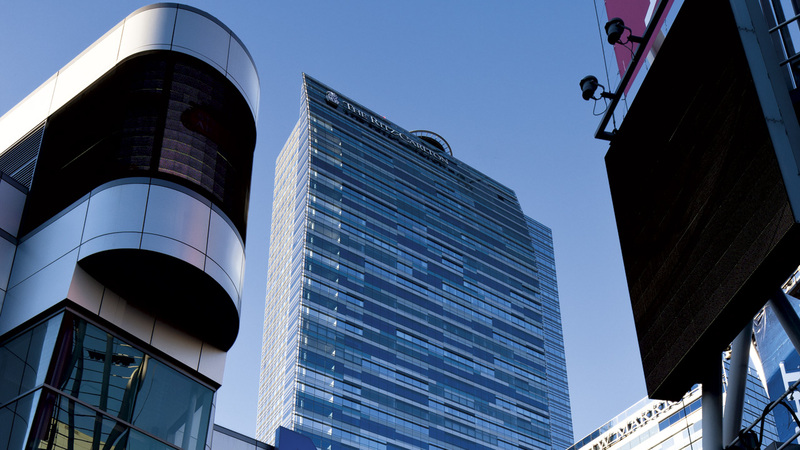 In the heart of Downtown Los Angeles, just steps from STAPLES Center, JW Marriott Los Angeles L.A. LIVE Hotel fashions a new standard for luxury. Our stunning 54-story masterpiece hotel is the focal point of L.A. LIVE, offering guests a front-row seat to this emerging entertainment, sports and dining epicenter. With convenience to the LA Convention Center, guests at our hotel also enjoy an unmatched location for attending events at STAPLES Center, Nokia Theatre, Club Nokia, the GRAMMY Museum, Conga Room, Regal Cinemas, and much more. Hosting many of L.A.'s most fashionable events, our luxury hotel boasts 100,000 square-feet of contemporary, state-of-the-art Los Angeles meeting and event space. 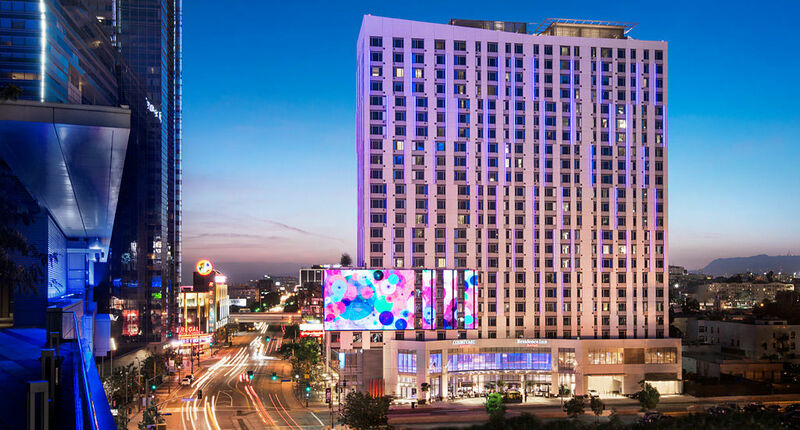 Entertainment events at L.A. LIVE are complemented by the hotel's lavish Ritz Carlton Spa®, a rooftop pool , dining options such as Wolfgang Puck's WP24 and LA Market Restaurant, modern yet comfortable guest rooms, and luxurious suites. 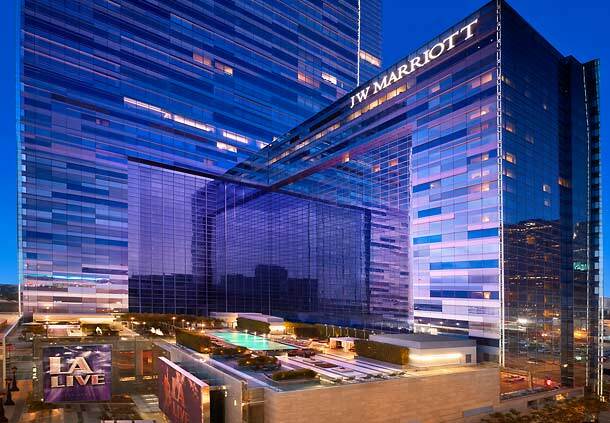 Entertain your senses at JW Marriott Los Angeles. Located steps away from STAPLES Center, Nokia Theatre L.A. LIVE, The GRAMMY® Museum and an array of downtown restaurants, entertainment venues and nightspots, The Ritz-Carlton, Los Angeles is a glittering star among Los Angeles luxury hotels, bringing a sleek, sophisticated atmosphere, refined service and sweeping views at every turn. A modern glass structure that soars high above the city, this urban oasis engages the city’s dynamic surroundings to provide guests with plenty of entertaining moments and cultural experiences. From food to fashion, art to opera, cinema to sports, The Ritz-Carlton, Los Angeles offers a true sense of place that never fails to elicit a second take. The Courtyard Los Angeles L.A. LIVE captures the excitement of the "most entertaining place on the planet" while striking the perfect balance of comfort and function. Our state-of-the-art spaces to eat, drink, socialize and slumber inspire productivity and encourage relaxation in a friendly yet modern environment. Catch our innovative vibe at Cafe Table 901. By day, the casual bistro serves healthy breakfast options accompanied by your favorite Starbucks drinks. By night, an array of beers, wines and custom-concocted cocktails complement a menu of hearty meals. Meet up with friends in our spacious, open lobby with convenient media pods, or host a conference, wedding or reception in event rooms that can accommodate groups up to 400 people. Our fitness center, outdoor pool and whirlpool will have you feeling energized and refreshed in no time. The luxurious beds in our well-appointed, tech-savvy guest rooms deliver a sound night’s sleep for an ideal way to wrap up an exciting day in the City of Angels.